1. Knitting two socks at the same time is not as hard as it sounds. 2. Knitting two socks at the same time is not as fast as it sounds. 3. Much as I love my home-girl Jodie‘s blog, the Saturday Market Bag is just not right for me (actually the Eugene Saturday Market isn’t really for me either, oh to have the low-key, not overcrowded, year-round Tuesday morning farmer’s market that was up the street in my old town back). 4. Wicked Stitches’ Promenade Bag is more my style. 5. It’s fast to knit too. 6. The WEBS wool is better suited for the Sunrise Circle Jacket than the recycled sweater. 7. I LOVE the SCJ pattern even more than I thought I would. I can’t believe this yarn (leftover from a Marsan Watch Cap I made my husband three years ago) has been lingering on a shelf in my craft closet while my paws have practically frozen off during the past two winters. The pattern is simple, the end product elegantly functional (love how the double rib fits snug on the wrist and on the palm) and FAST! The hand-dyed, hand spun superwash Merino is perfect for this pattern. I really want to knit these, but I don’t have any stash yarn that’s appropriate, the voodoo will definitely tide me over. I knit them on US6’s (4.25mm) and the wool could probably be knit on US10’s (6mm) with no problem, so these are DENSE. But hey, that makes them all the more effective at their job. Here’s hoping knitting the rest of the items on the stash list yields equally satisfying results. This is a muffin made using 2 cups of the homemade granola (recipe is in Nigella Lawson’s Feast… sorry I don’t think I am allowed to type the recipe here). These muffins are HEAVENLY… and quite nutritious. I can’t decide whether I like the cereal or the muffin better. This is granola I made from the recipe Adrian posted last year (I use pecans instead of walnuts). I became addicted to it about midway thru my pregnancy and still crave it seven months after baby girl was born. It is worth every second of effort put into making it. Think I can knit all of this AND run 100 miles before April Fool’s Day? It will sure be fun to try (and I’ll have an excellent excuse to buy new yarn… this is pretty much everything in the closet). 1. Enough Webs Garage Sale 2/4 Highland Tweed in Topaz to make myself a Samus. 2. 6 skeins of Lion Cotton Ease in discontinued Lavender that will become matching spring sweaters (still deciding on a pattern) for the girlies. 3. Enough Bernat Cotton-Tots in Turquoise to finish a Pinwheel Blanket for a friend’s baby boy due in mid-April. 4. 2 skeins of Dale of Norway Hauk – 1 Black 1 Natural , to make my husband a pair of fingerless gloves in some sort of fair isle design ( any suggestions?). 5. 1 hank Knitpicks Alpaca Cloud in Midnight to make the Swallowtail Shawl from IK Fall ’06 for my husband’s step-mom. She plays clarinet for the San Francisco Opera and needs elegant, black, warmth… I love having someone to knit shawls for! 6 .1 ball Rowan Kidsilk Haze in slatey blue (sorry lost the ball band) and 1 ball Berocco Hip Hop in complimentary blue/cream to make my mother-in-law Loopy. 7. Enough Plymouth Wildflowers DK Cotton in an army green (again with the lost ball bands) to make a pair of anklets. 8. Leftover Knitpicks Sierra in Cranberry and some pink Lamb’s Pride to make a pair of felted house slippers from Knit 2 Together. 9. A discount skein of random but nicely colored (sort of cinnamon and pink and cream) acrylic (yep, ball band is gone so no idea who made it, yardage, etc) that I thought would be fun to use experimenting making two socks at the same time (if I get completely frustrated I can throw it away and not feel bad). 10. Enough leftover hand spun superwash merino in a wine color that my mother in law gave me about 3 years ago to make a pair of voodoo wristwarmers for myself. DONE! 11. Lots and lots of Cascade 220 in a leafy green color… I’m confident it’s enough to make myself Wicked and I can’t wait. 12. Almost one big ball of Lion Kitchen Cotton in Neutral that I think will be enough to make a Saturday Market Bag for a friend. 13. Three old sweaters to recycle into new ones… A chicknits cutaway I knit in an orangey Plymouth Fantasy Naurale will become a tank top ( probably a chickami), an old red cotton storebought raglan of my husband’s will become an Hourglass from Last Minute Knitted Gifts for me, and a thrifted handknit wool cardigan that I bought when I was pregnant for $1 but no longer fits ,will be reinvented as a Sunrise Circle Jacket also for me. Whew… that’s a lot. But many of the projects are small ones. And I can definitely see that the majority of projects I’d planned for myself got shelved (literally) last year. That’s due in large part to the whole big belly thing, but now that the little miss is here and the flab is being run a go go’ed off, it’s time to knit for myself for a change! 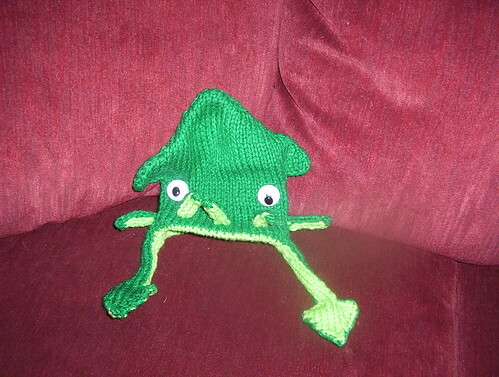 squidhat, originally uploaded by bnnymama. Appropriate acrylic. It’s not an oxymoron, I swear! Just check this out. I made this hat for a birth announcement for my younger daughter (it said Cthulu ate my Baby! )… I think she outgrew it during the photo session. Yep, it’s Red Heart and I don’t regret it for a second. Hmmm what about fun fur? Certainly not my thing, but I am here to tell you that if a mass of it works its way into your stash (I had a skein leftover from an ipod cover I made back in 2003) you can turn it into a fab boa for the toddler in your life. You’ll make his or her mama happy too, they are washable and they don’t shed brightly dyed (sometimes not colorsafe dye my carpet steamer and I are here to tell you) feathers all over the house. That said I took advantage of the rare opportunity when both of my babes were napping at the same time yesterday to clean out my craft closet. I tossed a bunch of crappy yarn into the donation pile and made an inventory and list of the projects I need to complete before I buy any new yarn (I’ll share it soon). I’m really excited. I feel like this is the end result of reaching a new level in my knitting. I want to take on meaningful projects this year and work with materials that match my work . For me, it’s becoming more about the thought going into the project (especially into the materials) and the resulting garment and not just working to learn a technique or develop a new skill… it’s going to be an interesting year. I started blogging two and a half years ago, right about the time I started knitting seriously. Then I had a baby, moved to a state where I could afford to be at home with her, and found myself blogging more about my family than is wise. I stopped blogging, had another baby, and knit and knit and knit. I’ve grown immensley as a person and become a pretty darn good knitter. I’m also one of the stealthiest knitblog lurkers around. Every time I read a great entry I pined for my old blog… Sure I could start a blog that focused on knitting (not my kids) but I’m picky, and on a limited budget. I just couldn’t afford to ressurect my beloved typepad account. When I discovered that Word Press would allow me to use the images I wanted in a free blog I signed right up. So here I am another knitblogger. Currently I’m engaged in a serious destashing effort while I work on Runagogo. And I mean SERIOUS. My stash is teensy tiny compared to many out there… and it includes an unhealthy dose of cheapo yarn I won’t apologize for. Using acrylic or otherwise crap yarn has helped me develop as a knitter… it’s been fine to learn with and I’ve used it appropriately. But I’ve knit with enough good stuff (and discovered Knitpicks and Elann) to be ready to move on. However… there’s this spendthrift in me that will not let me just drop it off at the St. Vinnie’s drive thru (at least not all of it… there’s a skein of Red Heart in the donation bag already)… so as I attempt to run 100 miles before April Fool’s Day I’m spending alot of time trying to come up with appropriate uses for all of the leftovers and dayreaming about a wooly, silky, linen filled future. What, you don’t believe in appropriate uses of crap yarn? Stick around and I’ll show you what I mean. This time with more wool. You are currently browsing the Bunny Slippers blog archives for January, 2007.